It is a sentiment that is commonly uttered by patrons at the NEHGS reference desk. And, as a genealogist, I can see the frustration. Because it is often these small details, these seemingly insignificant relationships that can help to break down age-old brick walls. But, and I think more importantly, these small details also allow researchers to connect with their ancestors on a more personal level. So, rather than recording dates and names (which, yes, are also important), genealogists should also aim to learn more about the lives of their family members. And while the above questions are a great way to get a conversation flowing, there are also other ways to stimulate memories from our ancestors. May I offer some advice of my own? My maternal grandmother, Mary Mohan (or Nana), was born in Bronx, New York, in 1932 to Patrick Mohan and Mary Rogan, Irish immigrants. Happily, Nana has always been one for storytelling, so I have been on the receiving end of countless stories about World War II war rations, street games, babies, the weather, her mother and father, and so on. Because of these stories, I feel a very close connection to her, as I know not only what she was like as a child and teenager, but also what she is like as a mother and grandmother. But I am always trying to get her to tell more stories about her parents and her childhood. This task has become more difficult over the years, as I have already asked the most obvious questions. However, one Thanksgiving, I made a breakthrough, when I showed her the enumeration of her family in the 1940 United States Federal Census. First, I showed Nana the listing for the Mohan family. She was able to see the names of her brothers, as well as the information for her parents. She made several comments about the information included for the Mohans, but for the most part did not provide any additional insight into the record. However, when I printed off the two pages before and two pages after the Mohan family enumeration, I got more information than I could have asked for. As I read aloud the surnames of Nana’s neighbors, trying desperately to pronounce the Russian, Italian, and German names correctly, she began to tell stories about each of her neighbors. “Oh, Mrs. Plag, she taught me the proper way to iron,” or, “Yes, the Denners were our German immigrant neighbors.” On and on, as I went down the list, she told more and more stories of her childhood. I made notations next to each of the families, asking follow-up questions as we went. It was a wonderful way to learn more about my Nana’s life in New York City. After the success of the 1940 United States Federal Census record, I looked for more resources that would spark memories with Nana. 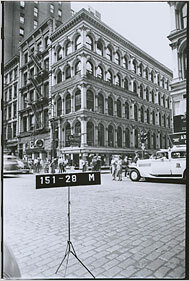 To do so, I ordered a black and white tax photograph of her apartment building from the New York Municipal Archives in New York City. Upon showing her the photo (as well as a photo of my Papa’s apartment building), the stories of her neighbors, other buildings, and the cars that were parked on the street began to flow freely. Nana and Papa began telling details of their lives that I would have never thought to ask about. Therefore, when you are surrounded by family and friends this holiday season, don’t limit yourself to the static interview questions from above. Be sure to also show old photographs and documents, as they may spark some new stories. It worked for me, and for that, I am truly thankful. Your blog post brought up wonderful memories of the day I sat at my Mom’s computer and showed her the 1940 census. She was only 4 years old in 1940, but she was fascinated. We went through the entire town (Hamilton, Massachusetts) and she remembered most of the families. She’d say, scroll down the names and say “He was the town doctor” and sure enough when we scrolled over it would list his occupation as physician. She would say,”that family lived across from the church” and then when we drove through Hamilton a few months later she’d tell me “Don’t you remember when I told you about that house and this family when we looked at the census?” She enjoyed it so much that I had to bookmark the pages for her so she could continue looking at the census, and she spent time on the phone with her brothers describing what she was looking at! I never thought that sitting down with her to look at the census would bring up so many memories! When the 1910 Federal Census was first made available, I began an index card for each family in our county. A lot of the names were familiar to me; I had heard my grandparents and other older people talking about them while growing up. One day I was working on the cards when my grandparents dropped in. My grandfather told about some of the families in his part of the county while he was growing up and I wrote what he said on the back of the cards as he went through the names. Needless to say, I had the same exhilarating experience as you did with the 1940 neighborhood census; and, more information has been added to many of the cards over the years. A word of caution — some of my grandfather’s stories are not for publication! I was fortunate enough to know one of my great grandfathers, who lived to age 92, when I was 8 and my brother 6. He lived about 250 miles from us, and because my father was very close to him, every spring my parents took us out of school and we went to visit him. The teachers always complained about how we’d miss “something very important.” My parents countered with how important it was to know our great grandfather. Here’s one memory my brother and I remember clearly. My brother, who’d never seen one before, asked about Grandpa’s magnifying glass, and was told that it helped him read the find print in the newspaper. A twinkle in his eye, Grandpa said it could also start a fire on a leaf. My brother wanted to see, so we all went out in the driveway, where a fire couldn’t get out of hand, and Grandpa demonstrated! Would school ever have taught us that science experiment about lenses? We were too young to ask him many questions about his life, but those annual spring visits taught us who the man was, and I’m very grateful my parents made sure we had them. With that foundation, we were eager for the stories our father told about growing up with him. What a treasure those family stories are, to add to the raw data required for genealogy. Thank you! This blog made me stop and think “Omigosh! I AM ‘The Grandmother’ now!”. Just this morning I told my friend “Just put it in the ice box …” , indicating our 7 day old Whirpool fridge. Now I recollect we had an ice box until I went to 1st grade AND that the ice wagons in Fall River and Attleboro was horse-drawn. Perhaps someone should interview me while I still remember most of my own 7 decades and many of my parents’ WW II tales as well. Nicely done, Lindsay. Don’t wait to be interviewed! Start writing those stories down. I have written some stories of my own life and more distant ancestors, but not the ones my parents told me about their WW II experiences, including having to get an icebox to put on the back porch when they brought me home from the hospital. Before I was born, they lived in a studio apartment. Heat was rationed during the day. Before I was born, they both worked, so it wasn’t a problem for them during the week. They’d get on a heated bus on Saturday morning, and go to the end of the line and come back. That was one way they learned to know all of Seattle that was on a bus line. The first floating bridge across Lake Washington had just been built, about a mile long. They would walk to the toll booth, which was on the other side, and just before they would have had to pay, turn around and walk back. There must have been an exemption for the heat rationing for churches and restaurants, as the stories of their walks seem to be only about Saturdays. These were among the stories they told when I was a kid, and while I don’t have grandchildren of my own, I should write them down so that my great nieces and great nephews know what life was like for their great grandparents. Whether they’re interested now isn’t the point. The stories should be there, waiting for them. You have given me something to look at in 2022 when the 1950 census comes out; my parents were married just after the 1940 census so they are listed as living with their parents in Boston and New York (City). In 1950 they lived in an apartment building in NY with three sons; a daughter would be born a year later. Unfortunately, they are deceased. My mother’s uncle purchased a farm house in Illinois and had it remodeled by Frank Lloyd Wright. My mother says that FLW was fired from the project but I can find no proof. I wish that I had asked her whather source was. Ask questions of your family members while you can. If only I could speak with ancestors. The previous generations are all gone and I am the “older” generation. I did not have the genealogical bug while they were alive and I do have questions.but, hopefully, my nieces and nephews will catch the bug as well and pass it on. Two of them have and that’s great but I sure do miss having folks to ask questions of.. Ask your grandmother: my goodness, how true, grandmother & grandfather were loaded with information. When my daughter started her search on ancestry, hours of research found links that looked relevent, and were logged, and confirmed by other researchers. Overjoyed with enthusiasm, I called my cousin to share the wonderful news, but to be informed that “Grandma Kelsey” was the mother of Grandfather Charles. Back to the library and after several weeks of scrolling through every village in Lewis County, Grandma Kelsey was found. My originol work was not in vain, for he was a distant cousin. A wonderful new world was uncovered as new ancestors arrived from the past, new stories of lost family came flowing through the decades, revealing the two World Wars, the Rebellion, The Patriot War, The War of 1812, The Revolution, The French & Indian War, King Philips War. The gaps that once existed, were shattered by Grandma Kelsey and I know why, she was from the family that signed “The Covenant”. wonderful…I will have to print out the 1940 census and sit with my Aunt Helen over the holidays! What great idea! We have been getting a lot of great stories from our oldest living relative, Uncle Fred, and showing him the censuses will undoubtedly spark even more. His wife, Aunt Ellen, mentioned that she didn’t know much about her family so my sister did some research and printed it all out. Aunt Ellen’s parents and grandparents were Christian missionaries in China so there were a lot of travel documents. Seeing those sparked all sorts of wonderful stories. Aunt Ellen was about five years old when they traveled by train all the way across Europe and Russia to get to China. She had been warned not to stick her head out the train window but she did it anyway and got cinders in her eyes. Her eyes were sore for some time. On a later trip by boat, she was seasick the whole way. Uncomfortable experiences but they cemented those trips in her young mind and we loved hearing her tell about them.